Another great sports official Vivian May Soars has passed on. I remember Vivian Soars from my early days of reporting in the 80s when women's hockey was one of my beats. My first impression of her was that she was a dedicated official. 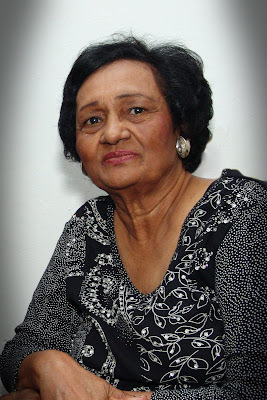 I remember with another dedicated official the late Dorothy Sibert Bailey who was the secretary of the Malaysian Women's Hockey Association (MWHA). Vivian was then the vice-president and if I am not mistaken the chairwoman of the selection committee. Those were the days of women hockey greats Rani Kaur, Mary Soo, Halimathon Yaakob, Yap Siew Bee and Daphne Boudville to name a few. But I remembered Vivian, Dorothy and Toh Puan Zainon even more when one afternoon in the early 80s, they walked into the New Straits Times office and went to see my then Group Editor, the late Tan Sri Noordin Sopiee. Tan Sri Noordin called in my sports editor, Tony Francis and told him that the great ladies, wanted me removed from covering women's hockey! I was not in the office, because sport reporters only come in the afternoon, unless there is a morning assignment. When I came in, Tony told me of the "visit" and their request. And obviously I asked Tony, what he had to say and he said: "I told them very simply that if they can find some else to cover women's hockey for me, I will remove you." I was flattered and that is Tony - he always stands by his reporters. Anyway, the reason why the ladies wanted me "out" was that they were not too happy with my reports which included some grouses of the players. But the meeting with my bosses and the ladies ended amicably and I was told by Tony to continue covering women's hockey and write whatever I thought needed to be reported as long as I did not get personal. Getting personal was never an issue because that is among the key elements of journalistic ethics . I was merely being passionate about my job and wrote the happy stories and also the sad and woe stories. In anycase, I got along well with the ladies after that and covered the World Women's Hockey tournament and women's Inter-Continental Cup held simultaneously in Kuala Lumpur. Malaysia played in the Inter-Continental Cup. As for Vivian, she continued to show her passion for the game and my first impressions were certainly spot-on - she was a very dedicated and passionate official. Dedicated and passionate officials like her are rare to come by these days. My deepest condolences to her family and May God Bless Vivian's soul and give her eternal rest. It is with great sadness we learnt the death of Ms. Vivian May Soars, one of our dearest comrades of women’s hockey in Malaysia. Ms. Vivian passed away on Friday (13/8/2009) at 4am at the University Malaya Medical Centre due to heart problems. It is indeed a great loss for the MWHA and women’s hockey in Malaysia. Ms. Vivian has truly been a lady with such grace, dignity and strength to pursue what she believed were the right of women. She has always been a testimony for women empowerment. She will be greatly missed by all of us in the hockey fraternity. Ms. Vivian was actively involved as a player beginning in the late 40s. She played for Selangor and represented many prominent clubs such as the Selangor Club. In the early 1960s, Ms. Vivian became a member of the Malaysian Women’s Hockey Association, representing the Selangor Hockey Association as a delegate. In 1971, Ms. Vivian was the Chief Coach of our national team playing in among the earliest foreign test-series in New Zealand. In September 1975 Malaysia participated in the IFWHA 1st Women’s World Cup Tournament in Edinburgh, Scotland. Enroute Edinburgh Malaysia visited Denmark where the team played three matches with State and Club sides and which were all won by Malaysia. The team was coached by Ms. Vivian. Her passion and dedication as a teacher further complemented her involvement in hockey. Ms. Vivian moved to Malacca in the 1980s as a teacher and within a short period of time, created a new dimension of hockey in Malacca. She became the President of Malacca Women’s Hockey, which created a direct link to the Federal body. Ms.Vivian moved back to Selangor to play an integral role in the Federal Hockey Association to organize two concurrent World tournaments, the World Cup and the Continental Cup in 1983. In 1984, Ms. Vivian became a Vice President in the Malaysian Women’s Hockey Association. Ms. Vivian was also a manager of the national team for several competitions such as the FALFA Cup. In the early years of women’s hockey in Asia, Ms. Vivian played an important role in representing Malaysian women. Malaysia was represented by two delegates, Miss Vivian Soars (Vice President) and Mrs. Dororthy Sibert Bailey (Hon. Secretary) at the Asian Women’s Hockey Federation Council Meeting at Madras, India from 25th to 27th January, 1975. Ms. Vivian Soars has indeed been a remarkable lady which made a great difference for Malaysian women’s hockey. The MWHA will greatly miss her but will ensure her dreams for Malaysian women’s hockey to reach great heights will always be held dear to our hearts and be pursued relentlessly. Ms. Vivian’s funeral will be held at the St. Paul’s church in Petaling Jaya, Selangor at 9am on 17/8/2009.